Today was a Snow Day here in Ohio for the local schools. Which meant a snow day for our Classical Conversations community as well. It was bittersweet to miss our extended family of friends – but we had an unexpectedly fun day in our home school instead! Our Math lesson today covered how to visualize what 1/4 looks like. We had four, equally sized, clear, empty containers. I filled one whole jar to the brim with liquid and asked my daughter to fill the other jar halfway (which would cause her original jar to be half). The lesson brought home how 1/4 is simply half of a half and that all four quarters come together to create a whole. We are just about finished with this RightStart Mathematics Level B course. It will take a whole other post to sing my praise about it. Let me just emphasize, for now, that it is a recurring theme throughout the book that numbers are related. We do not just add numbers for the sake of adding. All numbers have a relationship of which are either part or whole. The way they repeatedly drive this home, visually and kinesthetically, empowers me with the tools I need to teach my daughter, who cried during math last year with a different curriculum. She can now mentally add double digit numbers plus double digit numbers in her head. 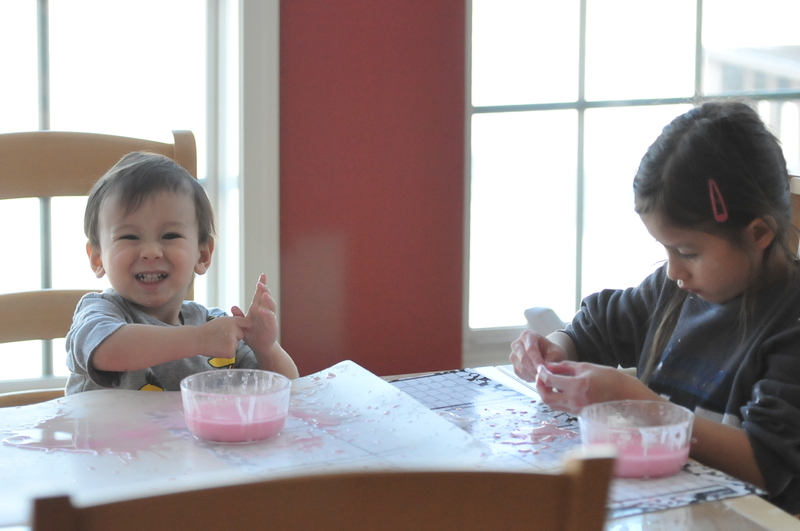 My 7-year-old daughter found images of the famous oobleck and begged to make it. So we got to it. Here is a recipe for oobleck if you’ve never heard of it, from Dr. Seuss’ famous story: Bartholomew and the Oobleck. This was my son’s first experience with gooey stuff. At first he was horrified, but you can see his delight below. My daughter was also curious as to the science behind the mixture. How did it feel so solid and then turn so liquid the next instant? Preschool Powol Packets defined the reason is “Oobelck is a suspension (a liquid mixture that has particles large enough to eventually settle out of the mixture).” This means it operates like quicksand. The long starch polymers press together when thrown or rolled on the table. My daughter had fun slapping it on the counter as a ball and then watching it ooze back to its liquid state. This happens because the polymers in the oobleck easily trap the water when pressed together and then behave like a solid. But when you let it go, no force, causes it to relax. The water then flows within the mixture and it behaves like a liquid. I was impressed she actually repeated this back to me after I explained it to her. Thank you Preschool Powol Packets! A Dr. Seuss birthday didn’t seem quite complete without including the Lorax. 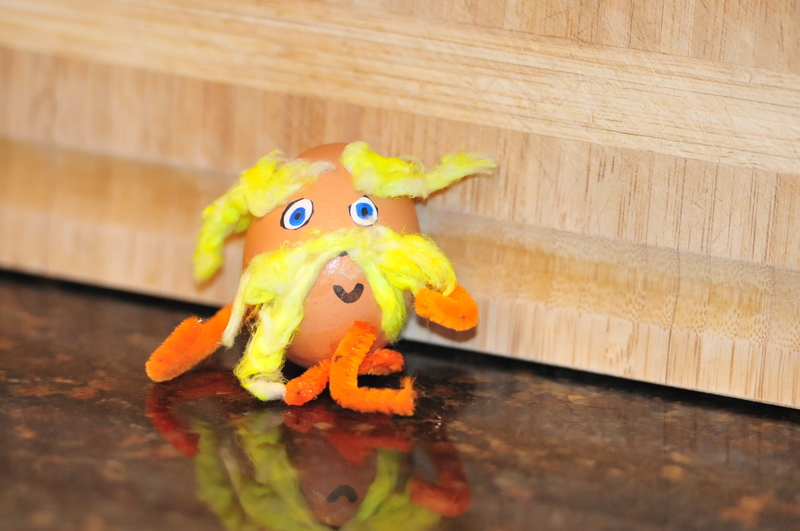 So, while I was boiling an egg for the Lorax creation she wanted to replicate, she drew her own version of Mr. Lorax. 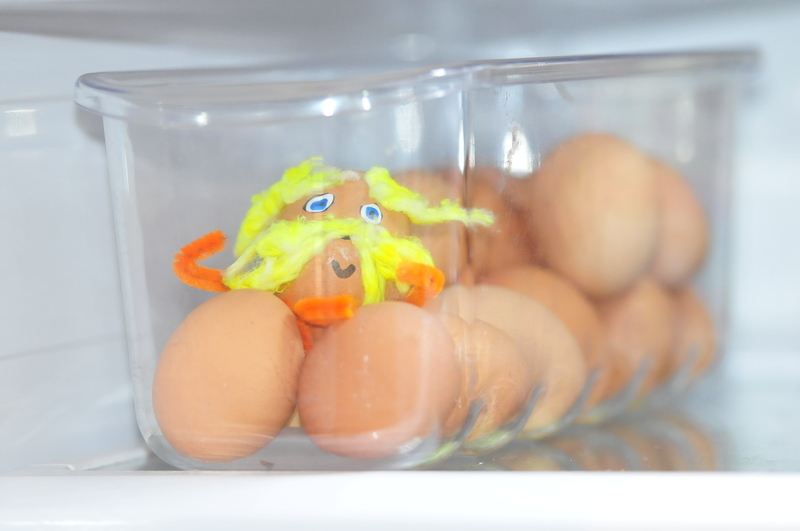 Here is the finished hard-boiled egg version of The Lorax. Isn’t he loveable? So easy to make. We used a blank sticker page for the eyes and stuck them on. Pipe cleaners for the arms. And we used cotton balls for his eyebrows and bushy mustache. We tried using yellow food coloring to color the cotton. That did not work at all. So she ended up coloring with a marker. And no, this was not my idea. It turned out just like what I found on Pinterest. This was so fun, we are gonna be celebrating all week long. I found a great site on pinterest that brought creative writing and copywork into the mixture. Inallyou.com posted GREAT FREE printables for both younger and higher elemetary grades. We finished the day with great prompts to get our own story juices flowing! Did you celebrate Dr. Seuss’ birthday? Join us this week and tell us what you did.